A very beautiful silver plated English tea strainer and matching drip bowl dating around the 1930s. This tea strainer has beautiful beading around its rim and a very smarty black handle with which to hold it over a teacup. 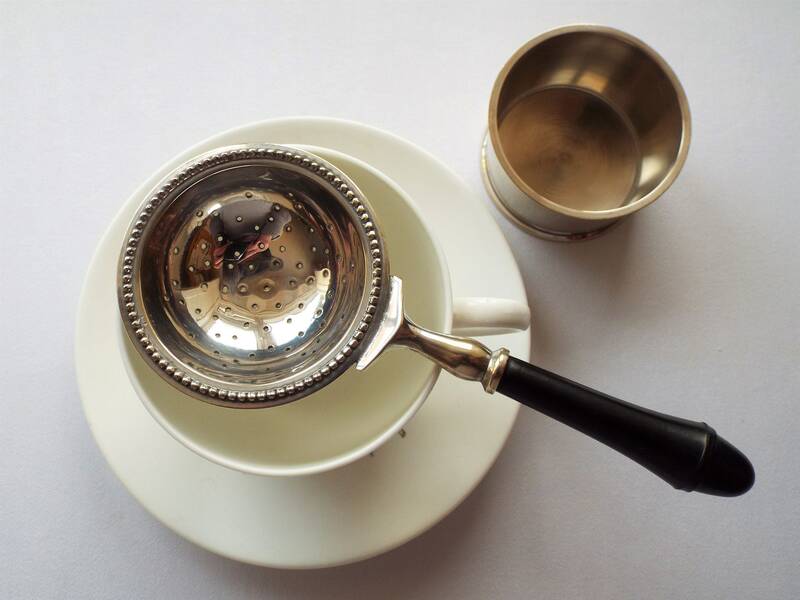 It is an extremely stylish and excellent quality tea strainer with a very smart drip bowl, making this a very special and collectable tea strainer. Whilst it has no maker's mark on either tea strainer or the drip bowl, it is quite clearly silver plated and has worn in accordance with how one would expect a silver plated item from this era too. The black handle is made from an early plastic and is also extremely smart and gives an extra eye catching element to this tea strainer set. A very good quality item that would be a lovely addition to a tea party or to your vintage teacup or tea set. It is of a pretty yet simple enough pattern design to work with both vintage and modern teacups and mugs. If you love drinking proper loose leaf tea in style this silver plated tea strainer is just right! It would also look fantastic with a tea set from the first half of the 20th century. The drip bowl means you can leave the strainer on the table at teatime without tea drips staining your tablecloth or marking your table and linens. In excellent vintage condition. The silver plate on both the tea strainer and drip bowl is still shiny and 'silver' bright still. There are some minor areas of wear in the bowl of the strainer, top side and underside and overall even thinning to the silver plate on the drip bowl, which is all minor and commensurate with its age and use. This is a lovely vintage tea strainer which would very smart on any tea table or tea tray. Any further wear is commensurate with age, please just ask for photos. Your tea strainer will arrive carefully packaged and beautifully gift wrapped FOR FREE in vintage style brown paper and ribbon. Please note, that due to its quality and excellent weight, this is a heavy item, which pushes it into a higher postage bracket than my other tea strainers. **Due to value, this item will only be sent 1st class 'signed for' to UK mainland addresses, and tracked and/or 'signed for' (depending on availability at the final destination) to international addresses outside of the UK. I have many more tea strainers available in the 'tea strainer' section of my shop, and I regularly add new ones.